The Fool, from the forthcoming, Magickal Musings Tarot. (C) Nefer Khepri. The current retrograde period runs from June 7 – July 1, 2014. The next retrograde period will be October 4 – 25, 2014. 10) If you have an altar in your home, this is prime time for cleaning & re-dedicating your sacred space. care. Focus on self-spiritual cleansings for yourself, chakra balancing, and self-healing. 8) It’s a great time to sort through old papers, books, photographs (hardcopy or on your comp), re-organize your filing system, & deleting old files off your computer. 7) House cleaning always seems to go quicker & easier during an Rx, or so I’ve noticed over the years. 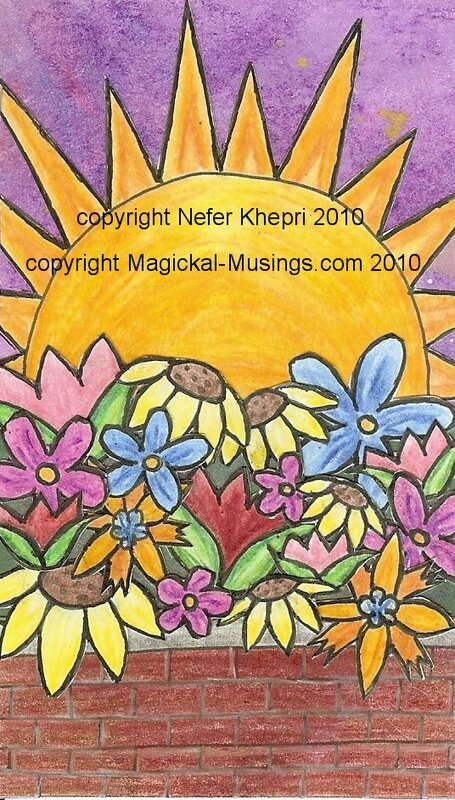 The Sun, from the forthcoming Magickal Musings Tarot. (C) Nefer Khepri. very few charity organizations that do not pay their CEO’s hundreds of thousands of dollars a year in salary. Take old books to a book resale shop. Many give store credit or will even pay you cash for your books, like Half-Price Books, if you have one in your area. 5) Mercury Rx is a great time to lay low & just RELAX. Cut back on social activities & just focus on YOU. 4) Practice cord-cutting with those who have blessed your life with a toxic relationship. Mercury Rx is great for clearing your life of negative energies. I have a simple, but highly effective cord-cutting method posted on my blog. 3) Focus inward & perhaps try meditation for the first time, or a new method of meditation. Past lives & the meaning of dreams can also be focused upon at this time with better results than usual. 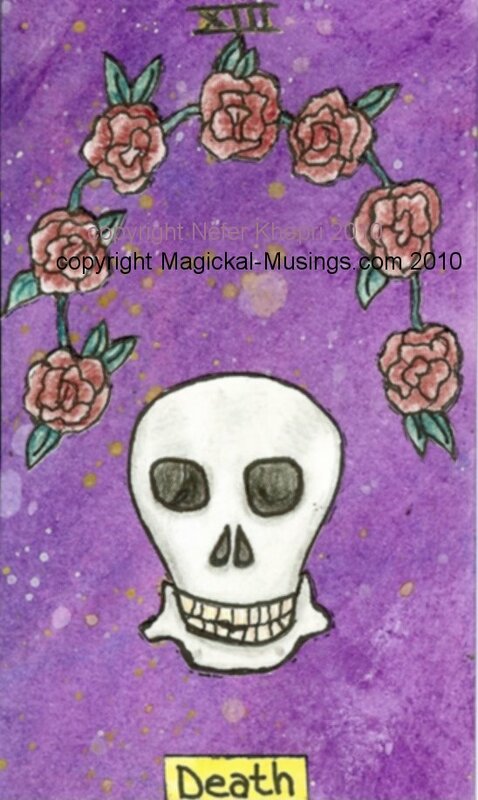 Death, from the forthcoming Magickal Musings Tarot. (C) Nefer Khepri. 2) Remember loved ones who have passed. Light a candle in their memory. 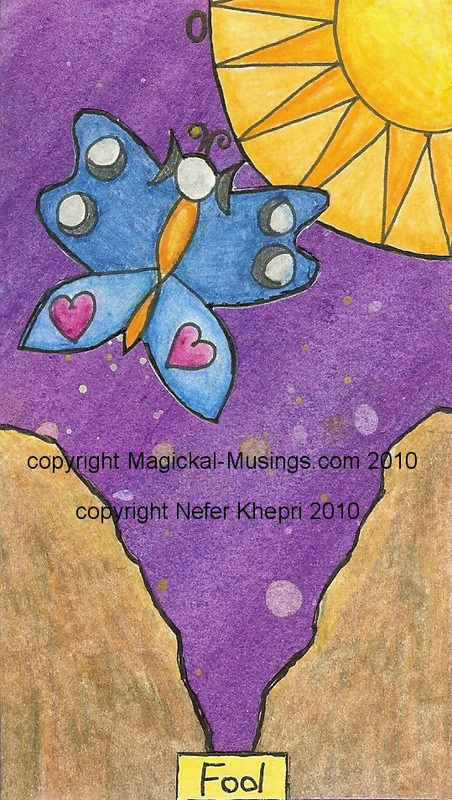 All images copyright Nefer Khepri, 2010. Reproduction is strictly prohibited. My forthcoming deck, “The Magickal Musings Tarot” will be available in 2016. I invite you to join my Facebook group dedicated to my decks, Soul Portraits & Manifestation Mandalas so you can keep up with developments as they occur. Previous I’m Grateful for Adversity. Next Mercury Retrograde: I’m Grateful it’s NOT Contagious!